There are 15 en-suite rooms at Eagle House Hotel. 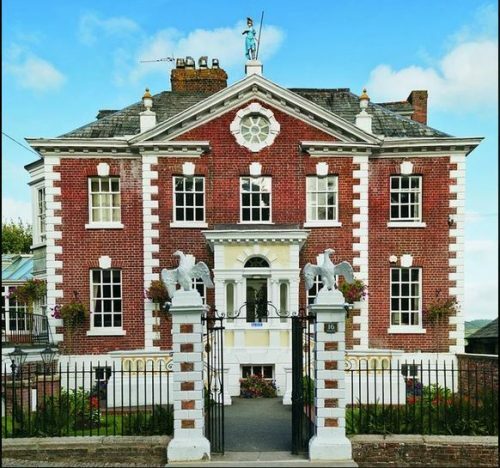 This distinctive Georgian building was built in 1764 by the mayor of Launceston after he won £10,000 in a lottery. Eagle House was a hotel from 1991 until 2015, when it closed. In 2017 it was reopened by the current owners and is the subject of an ongoing program of renovations. There are three grades of rooms at the hotel. Standard rooms are on the ground floor and are all dog friendly. Classic rooms are located on the second floor and the superior rooms are located on the first floor. A cooked or continental breakfast is served each morning and is included in the price. The hotel also serves food every day – enjoy a cream tea, lunch in the bar, or an evening meal. To book a room at Eagle House Hotel, click HERE.